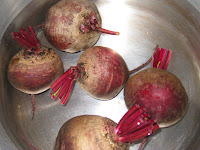 Just take a look at those beautiful beets. I love how richly red they are. This photo doesn't really do justice to how deeply ruby red they are. And I love those concentric rings that run through the body. And sweet? Sweet as candy. Especially the red ones. The golden and orange beets have a milder, less intense flavor, which includes the sweetness. And while I love the visual charms of mixing up the colors and flavors, I find myself heading for those deep jewel-red sweet reds almost every time. There is more than one way to cook a beet. When they first show up in the summer I do not feel like turning on the oven so I boil them. If you grill a lot you can cover them with oil, wrap them in foil and throw them on the grill, and when the weather is cooler you can throw them in the oven instead. They are a little less moist and the flavor is a little more intensified when they are roasted, but the heat from the oven is not enough of a trade-off for me. I don't really miss the more intense flavor when I boil them; I just notice it more when I roast them. The one thing you want to be sure of, regardless of the method you use, is that you get them really clean. Any dirt will cook along with the beets, and the flavor will get into them. I think that is why so people who don't care for them really don't care for them - they got hold of some dirty-tasting ones. If you are boiling them, don't cut off the ends. Leave about one inch of the stem on, and keep the root intact. This will help keep them from getting waterlogged. I put them in cold water and bring it up to a boil (like you do with potatoes, so the outside doesn't cook faster than the inside), then lower the heat, cover them, and let them cook for about 40 minutes. I know they're done when I stick a paring knife into one and it goes in smoothly and comes out the same way. When they are done I rinse them in cold water long enough to stop the cooking process. If I am going to use them in a salad, I usually put them in the refrigerator until they are cold, but that is not necessary. 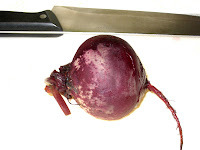 I place the beet on a cutting board and remove the ends. 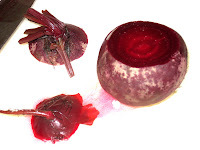 You want to be careful when you're cutting and peeling beets because they will stain anything they touch that same deep rich beautiful red that makes them so delicious. 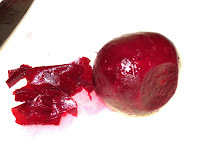 After the ends are removed, you can see where the skin puckers away from the beet a little. As you can also see, the water coming out from the beet is bright red. Some people wear those laytex gloves when they are chopping beets. I think that is a little extreme. 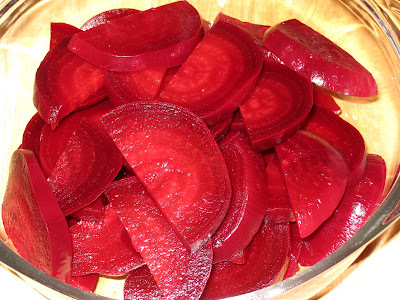 If you are careful, and wash everything that comes into contact with the beets immediately, you should be fine. They're just beets after all, not some toxic poison. 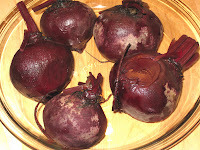 Once the ends are cut up, just pick up the beet and rub gently where you can feel that the skin is a little buckled. It should come right off. Just keep rubbing, applying pressure where you meet resistance, until all of the skin is off. The beet should feel a little slick in your hands. And that's it! Nothing could be more easy! Once the beets are peeled you can do whatever you want with them. If I'm using them for salads I will cut them in half and then slice them, as you can see in the picture above. If they are small I might cut them in wedges, and if they are really big then I might cube them. They are also good added in at the end of a stir-fry or vegetable saute. Even though they have a strong, unmistakable taste, that taste has a subtlety that blends well with other flavors. The next time you are at the farmers market or wandering down the produce aisle at the grocery store and you see these red gems, put them in your basket and take them home with you. Once you see how easy they are to prepare and how delicious they taste, you will not be able to get enough of them. Thanks for the tip on grilling them. We added a little minced garlic and dipped them in a honey citrus dip. Delicious. Thanks for the wonderful description of boiling fresh beets. And the pictures are beautiful. I am happy not to have to peel them raw and I learned how to keep them from getting water logged by keeping on a bit of their roots and stalks. You are amazing. You're welcome. I'm glad you found this helpful, and thanks for stopping by my blog! Actually... your description of boiling the beets merits the status of a great laboratory manual describing exactly the nuances along the way. I particularly like the line... "They're beets after all, not some toxic poison." Mine are cooking now... about 25 minutes in... I'm excited about what's coming ahead! Thanks again for a splendid post. And I shall check out your blog! I appreciate that, Biologykid. I hope everything went well with your beets!